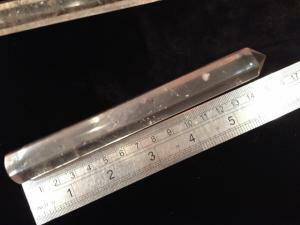 Before you start an energy healing session with your crystal wand, cleanse the crystal in your chosen way and ask or dedicate the crystal to the task required. To draw off "bad" energy from an affected area, hold the wand over the area with the point or narrow end of the wand pointing away. While doing this, picture in your mind the crystal drawing the negative energy out of the body, through the crystal, and then out the pointed tip. 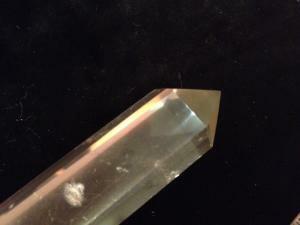 To draw in positive energy, hold the wand point down towards the afflicted area, once again visualize healing energy coming down through the crystal. With practice you will be able to use your intuition to determine when the healing is complete. It could take 1 - 15 minutes or even longer. After each use of the crystal please remember to cleanse and thank the crystal.